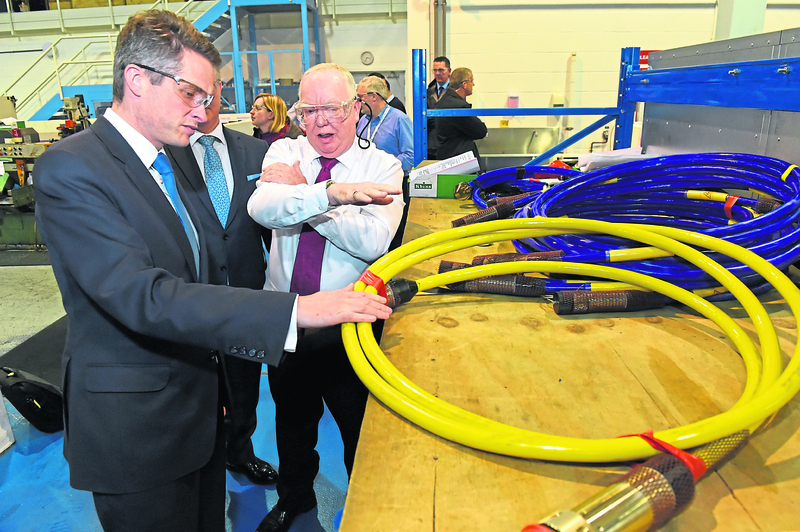 The Defence Secretary Gavin Williamson and local Gordon MP Colin Clark visited Defence supplier Hydro Group in Bridge of Don Picture of (L-R) Gavin Williamson, and Doug Whyte (Hydro Groups Managing Director). Hydro Group won a coveted Queen’s Award earlier this year, when managing director Doug Whyte said new subsidiaries in Asia and the US had driven its international operations to “the next level”. Mr Whyte, who co-owns the Ramsay Arms Hotel, at Fettercairn, near Laurencekirk, was born in Edinburgh but spent some of his childhood in Aberdeen. He returned to the north-east at 16 to study electrical engineering at the Robert Gordon Institute of Technology. After stints with Ferranti, Seaforth Maritime and Vickers-Slingsby, he established Hydro Bond Engineering – now part of Hydro Group – in 1982. The group now serves energy and defence industry customers around the world. Its oil and gas clients include blue-chip and major operators and contractors in domestic and international subsea markets. Other gongs for Hydro Group over the years include the company of the year accolade at the 2017 Subsea UK Awards and, for Mr Whyte, the firm’s 64-year-old majority shareholder, a director of the year title at last year’s Institute of Directors Scotland Awards. Accounts lodged at Companies House show the group narrowed pre-tax losses to £50,211 during the year to March 31 2018, from more than £254,000 in 2016-17. Turnover grew by more than £1 million to £91.7m in the latest period, while the group boasted an order book worth nearly £15m. But signing off the figures, director Elaine Blair said the financial performance was disappointing and worse than expected.